The Number 2 Armoured Car Company RAF was a military unit of the British Royal Air Force (RAF) which was part of Habforce and Kingcol during World War II. On 7 April 1922, “Number 2 Armoured Car Company RAF” was formed at Heliopolis in the Kingdom of Egypt. The company was placed under the command of Squadron Leader M. Copenan. Fordson armoured car waits outside Baghdad while negotiations for an armistice take place between British officials and representatives of the Iraqi rebel government. The Number 2 Armoured Car Company RAF was equipped with Rolls Royce armoured cars and Morris tenders. These were retained until 1944. 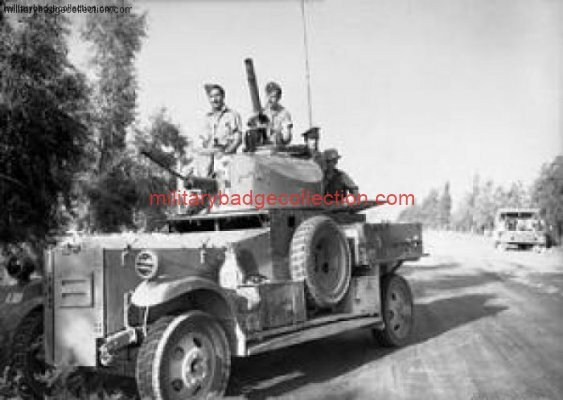 During the Anglo-Iraqi War, the company was initially located in the British Mandate of Palestineand was composed of eight Fordson armoured cars. 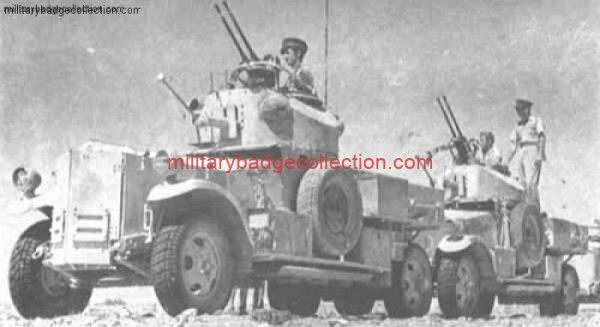 “Fordson” armoured cars were Rolls Royce armoured cars which received new chassis from a Fordson truck in Egypt. Photographs show some of these vehicles with turrets fitted with what appears to be aBoys anti-tank rifle, a machine gun, and twin light machine guns for anti-aircraft defense. On 3 October 1946, Number 2 Armoured Car Company RAF was incorporated into the RAF Regiment and was renumbered 2702 Armoured Car Squadron. On 25 Feb 1947, after pressure by Squadron members and veterans, it was renumbered as Number 2 Armoured Car Squadron. Seven years later, the armoured cars were gone and the unit was named Number 2 (Field) Squadron RAF Regiment. On 1 January 1970, the Squadron title changed again, this time toNumber 2 Squadron RAF Regiment. The Trans-Jordan Frontier Force was created on 1 April 1926, to replace the disbanded Palestine Gendarmerie. It was a creation of the British High Commissioner for Palestine whose intention was that the Force should defend Trans-Jordan’s northern and southern borders. The High Commissioner had been impressed with work done by The Arab Legion but local commanders thought it unnecessary to create an additional force when expansion of The Arab Legion might have been a better course of action. The Arab Legion immediately incurred a loss of more than half of its forces when they were transferred as cadre for the Frontier Force. In addition to the drop in personnel, The Arab Legion was also stripped of its machine guns, artillery, and communications troops. Unlike the Arab Legion, the TJFF was responsible to the British High Commissioner in Jerusalem rather than to Amir Abdullah of Trans-Jordan. The Force officially came under British Imperial Troops and appeared in British orders of battle. On creation at Sarafand on 1st April, 1926, with Lieutenant-Colonel FW Bewsher, DSO, OBE, MC, in command, the TJFF was organised into three cavalry squadrons (of 120 men each) and one camel company, together with six reserve troops (around 190 men). The first recruits to the TJFF were largely from the disbanded Palestine Gendarmerie. Arab peasants (fellahin) from Palestinian villages made up around 70 percent of the other ranks. There were some Sudanese in the camel company before 1930 when the company was replaced by a mechanised company. Jews and town Arabs, being better educated, served in the technical and administrative posts and by 1935 just under 25 percent of the Force were Circassians – a small ethnic, Muslim minority living in Trans-Jordan. The senior commanders were all British however junior officers were Palestinian Arabs, Circassians, Syrian Arabs, Sudanese and a few Jews. The Amir Abdullah was an Honorary Colonel of the Trans-Jordan Frontier Force from its inception. The TJFF commander was a British lieutenant colonel, with Headquarters at Zerqa. Second-in-command was a British major, responsible for administration, workshops, quartermaster’s stores and pay. The adjutant, also a British major, was responsible for training and personnel and was aided by an assistant adjutant who was a local Arab officer. The squadrons and companies were all commanded by British majors, with another British officer as second-in-command. The cavalry squadrons were organised into three rifle troops (36 men) and one machine gun troop (36 rifles and 4 MGs). The normal tactical and reconnaissance unit however, was the half-squadron or half-company and these were commanded by local captains. Each half-squadron or company consisted of two troops, led by local lieutenants and captains. By the end of 1927 there were 39 officers (17 British), 12 warrant officers (all British), three staff sergeants and 676 other ranks. In 1930 there were 17 British officers, two in each of the four squadrons and companies with the remainder at Force HQ. In 1935 there were 24 British officers – the CO, seven majors and sixteen captains. Lieut-Col Bewsher relinquished command of the TJFF in 1928 and rejoined his Regiment in the Regular Army. Command of the Force passed to Major (local Lt-Col) CA Shute, CBE, Indian Army, previously second-in-command. The TJFF spent its first six months training in Palestine, first at Sarafand then, from October 1926, at Shunet Nimrin in the Jordan Valley. Shortly after the HQ moved to Zerqa, Trans-Jordan, east of the Jordan River. The cavalry squadrons were based at Zerqa and the camel company at Ma’an. In 1929, the TJFF was called upon to help deal with Arab unrest in Palestine. The camel company moved to Jericho and a cavalry squadron went to Jisr el Majamie. In early 1930 a second cavalry squadron was despatched from Trans-Jordan as reinforcement. In 1930, a mechanised company was formed and later that year the camel company disbanded. The addition of motorised troops extended the range of TJFF troops for it had been discovered that the horsed cavalry was unable to travel far into the desert. The new mechanised company was based at Ma’an. During the year the strength of the TJFF was 980 men, including 28 Jews. The TJFF, while more smartly turned out and drilled than the more pragmatic Arab Legion, was not regarded as an elite force and it must be remembered that it primary role was that of police or gendarmerie. The Force had encountered great difficulties pacifying the desert tribes and in February 1931, Glubb, second-in-command of the Arab Legion reached an agreement with the TJFF that saw the withdrawal of outlying TJFF detachments from the desert to Zerqa and Ma’an, leaving the desert to be patrolled by Glubb’s newly formed Desert Patrol. In 1933 a second mechanised company was formed and further expansion occurred after the outbreak of the Second World War, in late 1940. In 1933 also, Lt-Col Shute completed his period of command of the Trans-Jordan Frontier Force, and was succeeded by Major (local Lieutenant-Colonel) CH Miller, 13/18th Hussars. Throughout this pre-war period, the TJFF was called upon to help quell Arab unrest (in protest at rising Jewish immigration) and, later, to help control Jewish immigration. At the same time, The Jewish Agency continually called for additional recruitment from the Jewish community. During November 1937, military forces together with the Police and the Trans-Jordan Frontier Force undertook an extensive operation near the Syrian frontier as a result of which a large gang was located and dispersed with casualties. The Force frequently participated in this kind of action and there was a steady trickle of casualties. The cost of operating the Force may be indicated by the British grant for the TJFF for 1938 which was a sum of 200,000 Lebanese pounds. On 1 January 1941, the cavalry squadrons were formed into 1st Cavalry (Horsed) Regiment at Jisr el Majamie followed in February by the formation of the 1st Mechanised Regiment (from the two mechanised companies) at Irbid. A Line of Communication Squadron was raised to protect the Baghdad-Haifa road. The first call to action was something of a disaster. The Mechanised Regiment was earmarked to join Kingcol, part of Habforce, in the relief of Habbaniya in Iraq in April 1941. ‘ D’ Company of the Regiment was at the H4 pumping station on the Iraq Petroleum Company pipeline but when ordered to advance against Rutbah, the men refused to cross the border into Iraq. As a result, the Mechanised Regiment was excluded from the subsequent campaign and ‘ D’ Company was disbanded. It was replaced by ‘ L’ Company, formed from the Line of Communication Squadron. A new squadron, the Mobile Guard Squadron, was formed to take over the line of communication duties. During this period, the cavalry squadrons were sent to Irbid-Jordan to ensure the security of the region. A watch was also maintained on the Syrian border in case of infiltration by pro-Axis troops. A better performance was achieved when in June 1941, both the Cavalry and the Mechanised Regiments joined British and Commonwealth forces in the Syrian campaign. The TJFF regiments supported the 5th Indian Infantry Brigade advance on Damascus, via Deraa, Sheikh Meskine and Kuneitra. The TJFF acted as advance guard, scouts and flank protection. They were given the special task of protecting the railway line, with the horsed and mechanised regiments being given their own sectors to patrol. Following the conclusion of the campaign, the TJFF left Syria in the Autumn of 1941, leaving behind cadres to instruct the newly formed Syrian and Lebanese armies. In 1942, the Force was on the Turkish frontier on ‘watch and ward’ duties. In November 1943, the Mechanised Regiment left Zerqa for Bandar Abbas on the Persian Gulf to help with the Middle East Anti-Locust campaign. The regiment spent six months in Persia. The TJFF was at Jezireh, Syria, in 1944 helping to keep the Syrians and the French apart. At war’s end in 1945, the Mechanised Regiment was in Syria and the Cavalry Regiment in northern Palestine. After the end of the Second World War, there were attempts at a return to pre-war normality, such as the holding of the “TJFF Open Horse Show and Display” at Sarafand, on the 27th and 28th June 1947, in aid of the The Jerusalem Babies Home (Anna Spafford’s) and the TJFF Benevolent Fund. However, the Force now became involved in helping with British attempts to control the growing violence between the Arabs and the Jews in Palestine. It was a role destined to make the Force extremely unpopular and the last CO, Colonel Hackett (later General Sir John Hackett, former CO of 4th Parachute Brigade which fought at Sicily, Taranto and Arnhem), was informed in January 1948 of the intention to disband the Force. On 9 February, 1948 the Trans-Jordan Frontier Force was disbanded. Many members of the unit were absorbed into The Arab Legion. 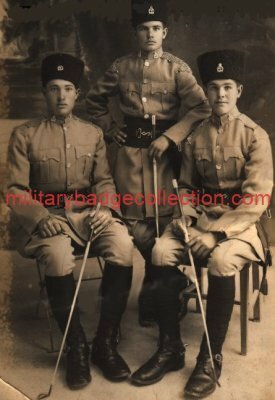 The Arab Legion (al-Jaysh al-Arabī) was the regular army of Transjordan and then Jordan in the early part of the 20th century. In October 1920, after taking over the Transjordan region, Great Britain formed a unit of 150 men called the “Mobile Force” under the command of Captain Frederick Gerard Peake to defend the territory against both internal and external threats. The Legion was based in Zarqa and 80% of its men were the local Chechens. It was quickly expanded to 1,000 men recruiting Arabs who had served in the military of the Ottoman Empire. On 22 October 1923, the police were merged with the Reserve Mobile Force, still under Peake, who was now an employee of the Emirate. The new force was named Al Jeish al Arabi (the Arab Army) but was always known officially in English as the Arab Legion. The Arab Legion was financed by Britain and commanded by British officers. The force was formed as a police force to keep order among the tribes of Transjordan and to guard the important Jerusalem–Amman road. On 1 April 1926, the Transjordan Frontier Force was formed from cadre drawn from the Arab Legion. It consisted of only 150 men and most of them were stationed along Transjordan’s roads. During this time the Arab Legion was reduced to 900 men and was also stripped of its machine guns, artillery, and communications troops. In 1939, John Bagot Glubb, better known as Glubb Pasha, became the Legion’s commander and transformed it into the best trained Arab army. During World War II, the Arab Legion took part in the British war effort against pro-Axis forces in the Middle East Theatre. By then the force had grown to 1,600 men. The Legion, part of Iraqforce, contributed significantly in the Anglo-Iraqi War and in the Syria-Lebanon campaign, the two decisive early victories for the Allies. The Arab Legion actively participated in the 1948 Arab-Israeli war. With a total strength of just over 6,000, the Arab Legion’s military contingent consisted of 4,500 men in four single battalion-sized regiments, each with their own armored car squadrons, and seven independent companies plus support troops. The regiments were organized into two brigades. 1st Brigade contained 1st and 3rd Regiments while 3rd brigade contained 2nd and 4th Regiments. There were also two artillery batteries with four 25-pounders each. On 9 February 1948 the Transjordan Frontier Force was disbanded with members being absorbed back into the Arab Legion. Although headed by Glubb, now a Lieutenant General, command in the field was by Brigadier Norman Lash. The Legion was initially withdrawn from Palestine to Transjordanian territory, under instruction from the United Nations, prior to the end of the British Mandate. With the commencement of hostilities the Legion re-entered Palestine with 1st Brigade heading to Nablus and 2nd Brigade heading to Ramallah. The Arab Legion entered Palestine with other Arab Forces on May 15, 1948 using the Allenby, now King Hussein, bridge as they were advancing to cover the approaches from Jenin, in the north to Alaffoula and from Al-Majame’a bridge on the Jordan River to Bissan Alaffoula. There was considerable embarrassment from the United Kingdom government that British officers were employed in the Legion during the conflict and so they, including a brigade commander, were instructed to return to Transjordan. This led to the bizarre spectacle of British officers leaving their units to return to Transjordan before sneaking back across the border to rejoin the Arab Legion. Without exception all of the affected officers returned to their units. One British MP called for Glubb Pasha to be imprisoned for serving in a foreign army without the King‘s permission. A few days before the war, Legion troops were involved in the Kfar Etzion massacre. At Latrun, the Legion blockaded the Jerusalem highway. On May 28, 1948, they conquered the Jewish Quarter of Jerusalem’s Old City (i.e. inside the walls of the Old City), expelled the Jews who lived there and took part in the destruction of the synagogues therein. The Legion also secured the West Bank for Transjordan. Kfar Etzion massacre from 10 to 13 May 1948. Battles of Latrun from 20 May to 18 July 1948. Siege of Jerusalem from 17 May to 18 July 1948. On 9 February 1948 the 3,000 strong Trans-Jordan Frontier Force was disbanded with members being absorbed back into the Arab Legion. By the wars end in 1949, the Arab Legion consisted of over 10,000 men manning a 100-mile front, which then expanded to a 400-mile front following the withdraw of Iraqi forces. On September 11, 1956, an Israeli force in what the IDF termed one of its retribution operations raided Jordanian territory at Al-Rahwa, Hebron Sector, attacking the police station and clashing with a unit from the Legion’s Desert Force. The Legion generally stayed out of the 1956 Suez Crisis. On 1 March 1956, the Legion was renamed as the Arab Army (now Jordanian Armed Forces). In Israel, the Hebrew term “Ligioner” (ליגיונר), i.e. “Legionary” was still informally used for Jordanian soldiers for many years afterwards, also at the time of the 1967 war and its aftermath. The Aden Protectorate Levies (APL) were a militia force for local defense of the Aden Protectorate. The Levies were drawn from all parts of the Protectorate and were armed and officered by the British military. They used the Lahejemblem of crossed jambiyah (traditional curved double-edged dagger) as their badge. The APL were formed on 1 April 1928 primarily to protect Royal Air Force stations following the change of status of Aden to an Air Command in April 1927. Their secondary role was to be that of assisting the civil police. The APL also formed a Camel Troop. Colonel M.C. Lake of the British Indian Army was the first Commanding Officer until Lt. Col. J.C. (Robby) Robinson took over command in 1929 and remained as C.O. till 1939. In 1928 the APL comprised two British officers and six platoons of Arabs (each one officer and 34 men) recruited from tribes in the Western Protectorate states, they had 48 camels and 8 mules. The APL recruited from the various tribes which lived in the foothills or the higher mountainous regions of the protectorate. Based in Aden Colony was the APL Depot Battalion, the Levies Base and Training Organisation. The Depot included married quarters, a neonatal clinic, a school for children, the APL Band and the APL Camel Troop. Air supply and other repair and supply units also were based there. The APL Hospital (ALH), located near Khormaksar, was a 160 bed RAF general hospital where free medical care was given to the APL’s 1,500 men active members and their families, and also to former members, about 10,000 people in all. The ALH also provided the veterinary medicines to the APL. The hospital CO was an RAF doctor assisted by two RAF warrant officers, and an administration and supplies staff. Medical coverage was provided by three RAF doctors and a surgeon who were assisted by local doctors. The other RAF personnel were two male nurses, two laboratory technicians and a Pharmacist. Local people made up the rest of the staff and all of them would have been trained on site. Arab Officers (Bimbashis), one of whom in each Battalion was responsible to the Commanding Officer for Arab Administration, held Governor’s Commissions as 2nd Lieutenant (MulazimIth Thani); Lieutenant (Mulazim Al Awal); Captain (Rais); and Major (Wakil Qaid Ith Thani). The senior Arab was a Lieutanant Colonel (Qaid Al Awal). By 1939 the APL Anti-aircraft Wing shot down an Italian plane. 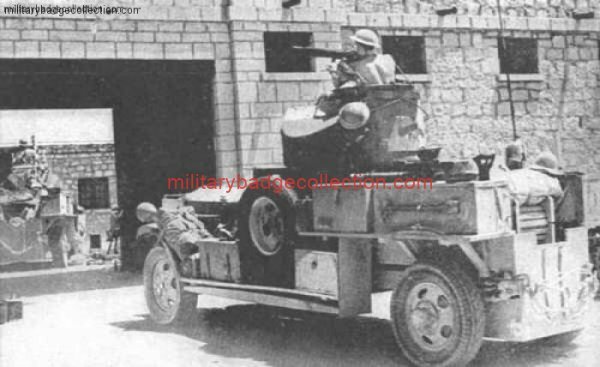 During World War Two the APL consisted of 1,600 men operating in Aden and the Western Aden Protectorate but also providing garrisons at Socotra Island and Sharjah. In 1942 British Army personnel started being replaced over a period of 6 years by RAF Regiment officers and airmen by 1948. During the December 1947 anti-Jewish riots, when there were no regular British troops in Aden at that particular time, Aden’s Jewish community felt some relief when they heard that the APL were to be bought in to protect them. But the Levies, being Arab Muslims, were seen to turn a blind eye to the violence and themselves fired indiscriminately on the Jews, killing many. In 1960 the APL consisted of four rifle battalions each of which had 3″ mortars, medium machine guns and signallers, and a Mechanical Transport Platoon. The APL was a brigade-equivalent with its own air supply and air liaison officers and the Senior Arab Officer. Plus there was the APL Armoured Car Squadron, the APL Signal Squadron, the APL Band and the APL Camel Troop. The APL Camel troop was a ceremonial unit conducted many public appearances. On 30 November 1961, following the creation of the Federation, the APL changed name to the Federal Regular Army. 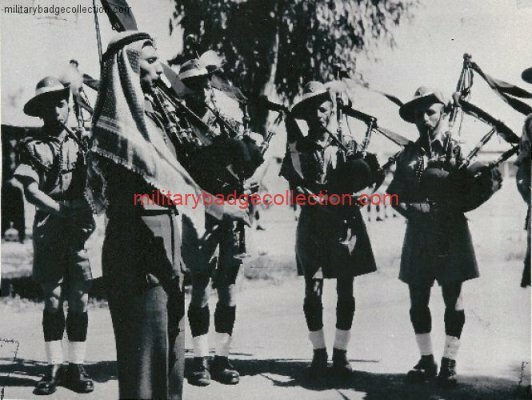 The Palestine Regiment was a regiment of the British Army that was formed in 1942. During World War II, the regiment was deployed to Egypt and Cyrenaica, but most of their work consisted of guard duty. In 1940, Jews and Arabs living under the British Mandate for Palestine were allowed to form separate companies, known as Palestine Infantry Companies, and join the Royal East Kent Regiment, known as the “Buffs.” The British had intended to recruit an equal number of Jews and Arabs, but this proved unsuccessful. The Palestine Regiment was formed in 1942 with the Palestine Infantry Companies that were attached to the Buffs. The regiment was divided into separate Jewish and Arab battalions. According to historian Ashley Jackson the regiment consisted of 1600 Jews and 1200 Arabs and according to writer Howard Blum, Jews outnumbered Arabs by a more than three to one ratio. The Jewish companies were then formed into three battalions, which became the new Palestine Regiment. Personnel of the Palestine Regiment formed the core of the Jewish Brigade. The Jewish Infantry Brigade Group (more commonly known as the Jewish Brigade Group or Jewish Brigadewas a military formation of the British Army that served in Europe during the Second World War. The brigade was formed in late 1944, and its personnel fought the Germans in Italy. After the war, some of them assisted Holocaust survivors to emigrate illegally to Israel, as part of Aliyah Bet. Following the First World War, the British and French empires replaced theOttoman Empire as the pre-eminent powers in the Middle East. This change brought closer the Zionist movement’s goal of creating a Jewish state. The 1917Balfour Declaration signified the first official approval of such a proposal, providing the impetus for a surge of Jewish emigration, known as the “Third Aliyah“. Progressive emigration through the 1920s and 1930s followed the League of Nations sanctioning of Balfour’s statement, and the Jewish population expanded by over 400,000 before the beginning of the Second World War. The President of the World Zionist Organization Chaim Weizmann offered the British government full cooperation of the Jewish community in the British Mandate of Palestine and tried to establishment an identifiably Jewish fighting unit (under a Jewish flag) under the auspices of British Army. His request for a separate unit was rejected, but many Jews joined the British army, some in Jewish companies. Fifteen Palestinian Jewish battalions were incorporated into theBritish Army in September 1940 and fought in Greece in 1941.